So you’ve decided to take the plunge and run your own business? Congrats! We’ve got all your invoicing needs covered. Meet Solna. More than just invoice templates. Being a freelancer is one of the toughest professions out there. Not only are you your own boss, you’re also the marketing, sales, operations and finance teams. You decided to go it alone because you wanted to focus on delivering a great service to your clients, work on your terms, and likely, not getting bogged down in mundane (but important) financial admin. Sending word and excel invoice templates will only get you so far, but as you scale your business, you’ll need to automate as much as possible. That’s where Solna comes into play – the invoicing solution designed for the modern day freelancer. Solna allows you to create, customise, and get paid in via e-invoicing, so you can get back to getting more clients and those money stacks. Go on, sign up and make your bank account happy! Create professional looking, personalised invoices, that match your company’s brand in seconds. Choose from 5 beautifully designed templates, or create your own customised invoice template. Upload your logo and really impress your clients! 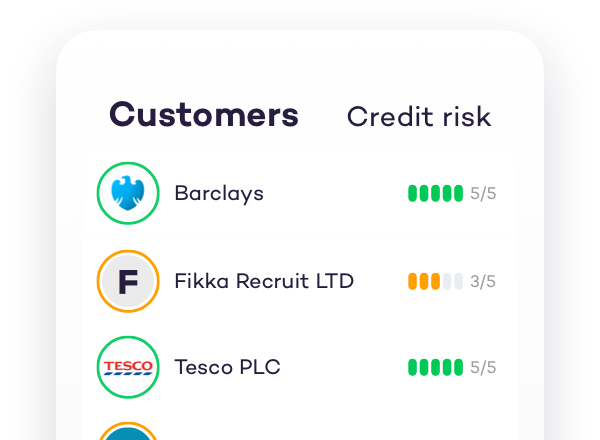 Solna links your invoices with your customers’ current credit scores, so you can make the best decisions when setting your terms. Can your current invoice template do that? What should I include on my freelancer invoice template? Making sure you include the right information is key if you want to get paid on time. Often, freelancers experience delays in payment, and the fault does not always lie with the customer. The smallest mistake can result in a delay of payment. Not adding your bank account details? That’s a sure fire way to get paid a few weeks late! KISS (Keep It Simple Stupid): Have a thought for simplicity and make sure all the details and information is available to your client on the initial glimpse. Do everything you can to help your client process your invoice payment in no time. Company logo: Adding your logo is a great way for you to look professional in the eyes of your client. You’re in the big boy/girls league now and you don’t want to look shabby with a terrible looking invoice. Invoice payment terms: Make sure your client knows your payment terms before you engage with them, and equally as important, make sure that info is clearly visible on the invoice. Three crucial pieces of information to include on your invoice are the total amount due, the due date, and the terms of payment. This keeps everybody on the same page and makes sure everything is clear for both parties. Add a thank you note: No matter how technology advances and makes our lives easier, business is and will always be about relationships. You’ve done some good work for your client and now it’s time to get paid but make sure you thank them…so there will be a next time. 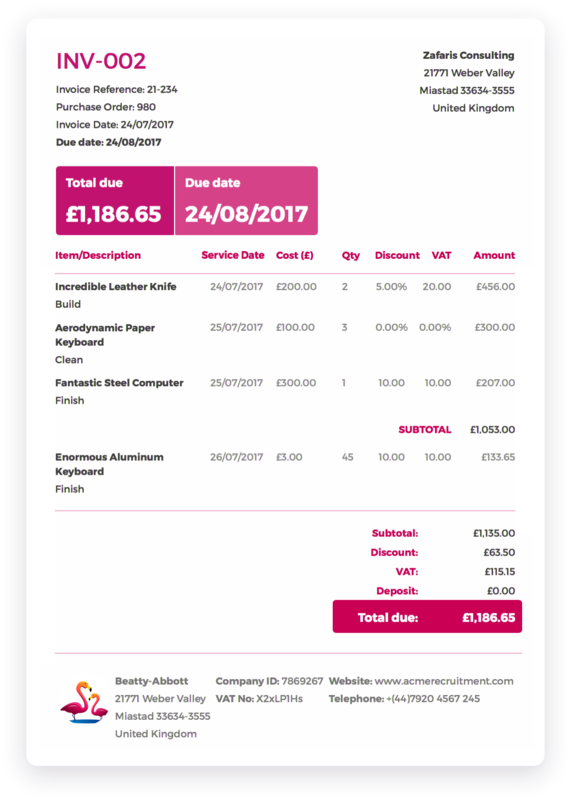 Want a bespoke invoice template? 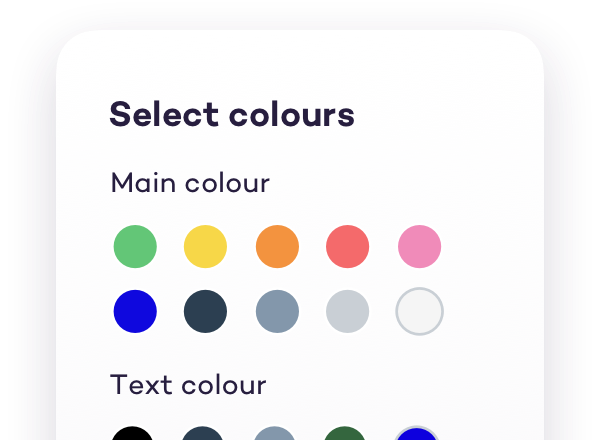 Our customisation functionality allows you to quickly create invoice templates that not only match your brand but also your industry. 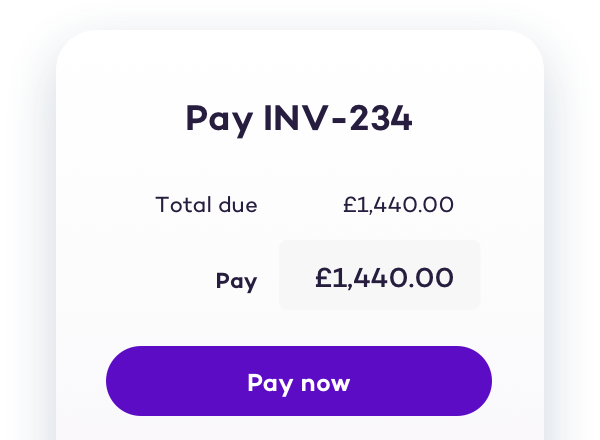 Sending the right kind of invoices, with all the relevant information can make a huge difference in whether you get paid on time or 4 weeks past the due date. That’s not all, we have even more features! Download your invoices in PDF and send them via email. Set automatic payment reminders to encourage your customers to pay you on time. Track exactly who’s viewed your invoices so you can properly chase your customers if required. Create more than one account for your other businesses.